The plaque commemorates those who served in the 2nd / 3rd Australian Machine Gun Battalion during World War Two. 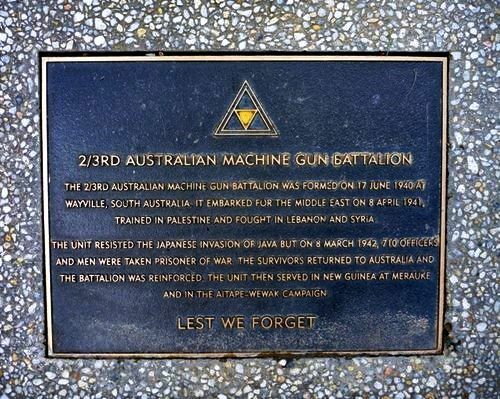 The 2 / 3rd Australian Machine Gun Battalion was formed on 17 June 1940 at Wayville, South Australia. It embarked for the Middle East on 8 April 1941, trained in Palestine and fought in Lebanon and Syria. The unit resisted the Japanese invasion of Java but on 8 March 1942, 710 officers and men were taken prisoner of war. The survivors returned to Australia and the Battalion was reinforced. The unit then served in New Guinea at Merauke and in the Aitape-Wewak campaign.